— Support audio/video/picture in the iPhone&iPad convert into HD digital signal to all devices with HDMI ports. — Support all formats of audio, video and picture. — Resolution: 480p, 720p, 1080p. Work with all of the over IOS 8.0 Version. — Compatible with iPhone X/8/8 plus/7/7 plus/6s/6s plus/6/6 plus/5s/SE/5/5c (iOS 8.0 or later). — Compatible with iPad mini 2/mini 3/mini 4/Air 2/ Air 3/ Air 4/Pad Pro. — Compatible with iPod Touch 5th/6th Generation. — First connect the digital AV adapter with the HDMI interface. — Second connect the power with the USB port. — Third connect the port to the phone. Make your business easy and convenient .A must have for business processing. just plug it in your devices to the projector or tv, you will easily do the presentation, process the datas, slides or images with your workmates in the bigger screen. 40 days worry-free refund or replacement. If you have any issue with the HDMI cable, Please contact us and our team will respond to you within 24 hours. 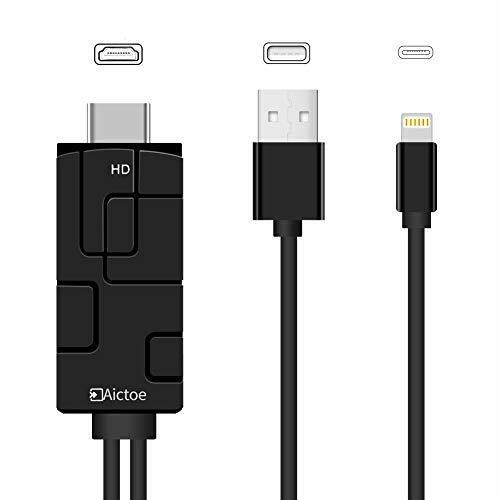 ENJOY& SHARE: You don’t have to put up with small screens anymore.This cable to HDMI adapter is easier to enjoy your favorite movies and games from your iOS device to big screens like TV/Projector/Monitor. Connect the device which with HDMI interface, you can share videos/audios/pictures with your family and friends on the big screens.